Laem Son National Park is located in Ranong and Phangnga provinces, Thailand. It is situated 60 kilometres (37 mi) south of Ranong on the country's west coast, with 100 kilometres (62 mi) of Andaman Sea coastline, making it Thailand's longest protected shore. The marine national park is named after the pines along the cape's shore. It was established in 1983, and is 315 square kilometres (122 sq mi) in size. The NP is a coastal area with beaches, coral reefs, mangrove swamps, and a rainforest jungle. From the beach at Hat Bang Ben, some of the 20 offshore islands are visible, such as Ko Kam Yai, Ko Kam Noi, Mu Ko Yipun, Ko Khang Khao, and Ko Phayam, while Ko Kam Tok (alternate Ko Ao Khao Khwai) and Ko Kam Yai are not visible from this beach. The islands of Piak Nam Yai and Thao are noted for stone-tool usage by long-tailed macaques. In 2002, the Laemson National Park-Kapoe Estuary-Kra Buri River Estuary area became a designated Ramsar site. Subsequent to the 2004 Indian Ocean earthquake and tsunami, the park headquarters were flattened, and Ao Khao Khwai (Bull Horn Bay) was split into two small islands. A consortium of institutional partners are facilitating a mangrove restoration project at Laem Son. 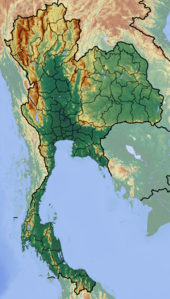 Wikimedia Commons has media related to Laem Son National Park. ^ Braatz, Susan M. (November 1992). Conserving biological diversity: a strategy for protected areas in the Asia-Pacific region. World Bank Publications. pp. 57–. ISBN 978-0-8213-2307-6. Retrieved October 1, 2011. ^ Hoskin, John (October 2006). Thailand. New Holland Publishers. pp. 109–. ISBN 978-1-84537-549-2. Retrieved 10 December 2011. ^ a b Williams, China (1 August 2009). Thailand. Lonely Planet. pp. 638–. ISBN 978-1-74179-157-0. Retrieved 10 December 2011. ^ Angell, James Burrill (December 2000). Water is the Animal: Fin de Millenaire Reflections of Planet Earth from a Diplomatic Courier. iUniverse. pp. 104–. ISBN 978-0-595-15423-4. Retrieved 10 December 2011. ^ Haslam, M.; Gumert, M. D.; Biro, D.; Carvalho, S.; Malaivijitnond, S. (2013). Noë, Ronald, ed. "Use-Wear Patterns on Wild Macaque Stone Tools Reveal Their Behavioural History". PLoS ONE. 8 (8): e72872. doi:10.1371/journal.pone.0072872. PMC 3745380. PMID 23977365. ^ Gumert, Michael; Fuentes, Agustin (30 May 2011). Monkeys on the Edge: Ecology and Management of Long-Tailed Macaques and Their Interface with Humans. Cambridge University Press. pp. 332–. ISBN 978-0-521-76433-9. Retrieved 10 December 2011. ^ Malaivijitnond, S.; Lekprayoon C; Tandavanittj N; Panha S; Cheewatham C; Hamada Y. (February 2007). "Stone-tool usage by Thai long-tailed macaques (Macaca fascicularis)". Am J Primatol. 69 (2): 227–33. doi:10.1002/ajp.20342. PMID 17146796. ^ Oh, J.V. ; Ratner, B.D. ; Bush, S.R. (September 2005). Kolandai, K.; Too, T.Y., eds. Westlands Governance in the Mekong Region. The WorldFish Center. pp. 152–. ISBN 978-983-2346-40-1. Retrieved 10 December 2011. ^ Meprasert, Somrudee; Oregon State University (2006). The 2004 Indian Ocean tsunami: Tourism impacts and recovery progress in Thailand's marine national parks. ProQuest. pp. 17–. ISBN 978-0-542-96361-2. Retrieved October 1, 2011. ^ Kallesøe, Mikkel Franklin; Bambaradeniya, Channa; Iftikhar, Usman Ali; Thushara Ranasinghe; Sriyanie Miththapala (2008). Linking coastal ecosystems and human well-being : learning from conceptual frameworks and empirical results. IUCN. pp. 31–. ISBN 978-955-8177-83-9. Retrieved 10 December 2011. This page was last edited on 27 June 2017, at 09:37 (UTC).